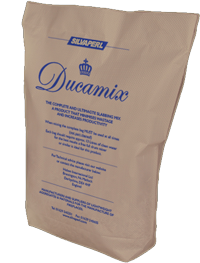 Ducamix is a blend of Cement, lightweight aggregates, including Perlite. The mixture forms a lightweight concrete for high temperature application e.g. for fireplace and hearth manufacturing and around boilers. The above product information is given in good faith as accurate and reliable but is not to be taken as a guarantee. The figures provided are intended to be a guide to expected average values and should not be interpreted as a specification. Any potential applications referred to are not to be construed as recommendations. It is the responsibility of the user to determine suitability for any specific purpose.